What's on my membership page? Desktop / Mobile (Also find exclusive member's only content). 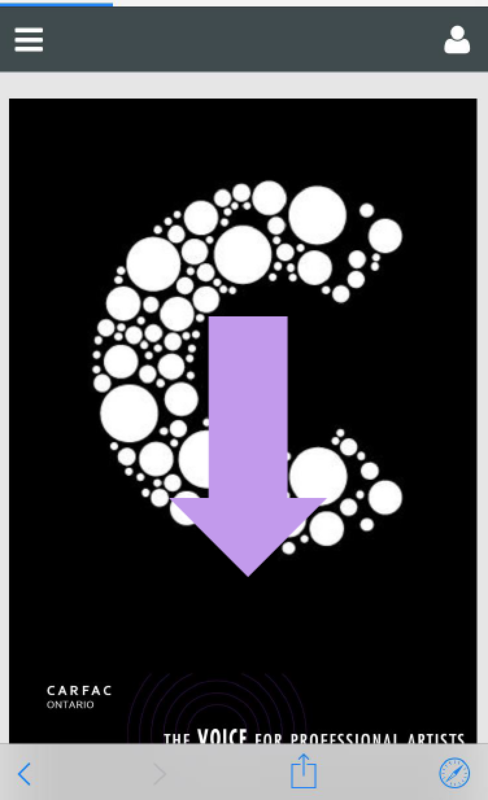 click the button at the top left corner. “BECOME A MEMBER” and click it. 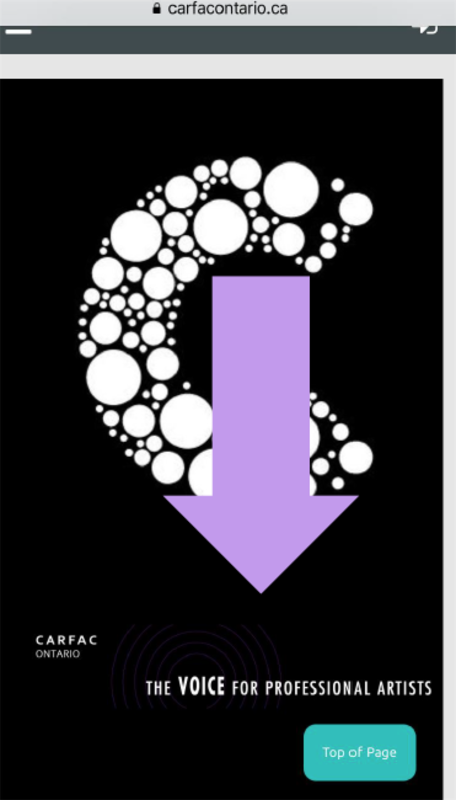 Keep scrolling down until you will find this section. Select one of these types of membership applicable to you. Then scroll down and click “NEXT” button. 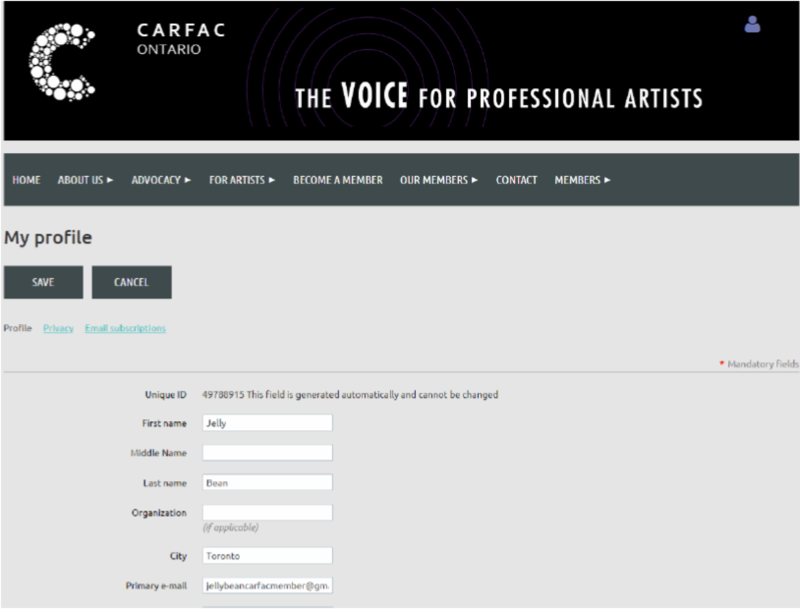 A new page appears the under the CARFAC Ontario banner again. Keep scrolling down until you will find to the section to enter your primary e-mail. On the next page, please fill in the application form. 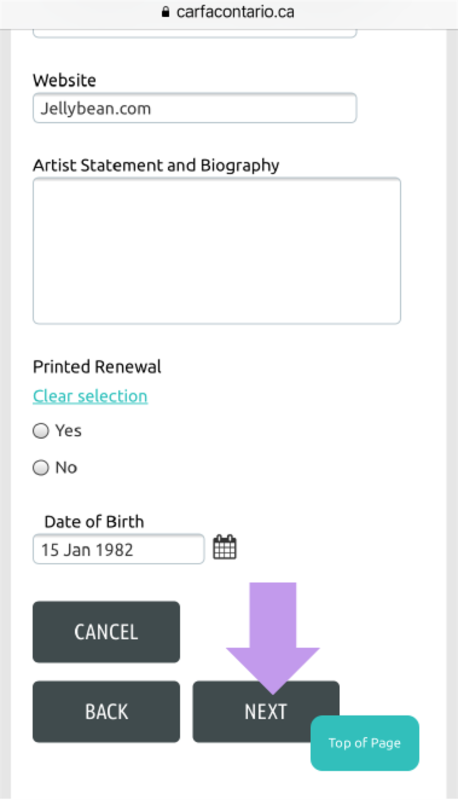 You will need to fill in your Date of Birth to submit the form. This is kept private from fellow members and the public. All other red asterisks * are required to submit your application. 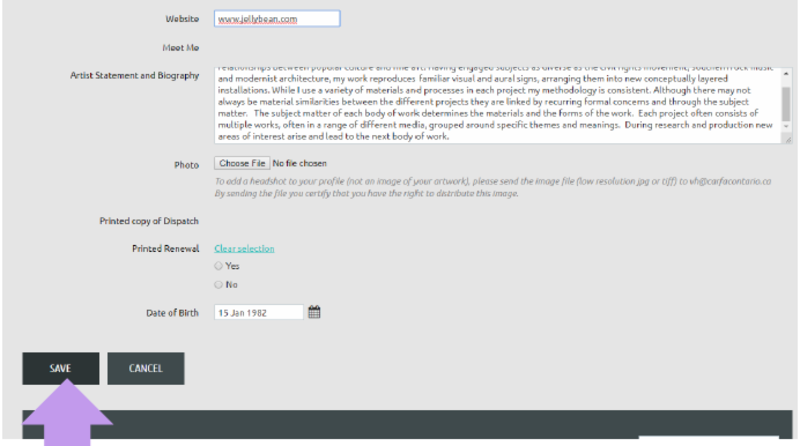 *You can edit the profile later if you wish to update your information at any time. 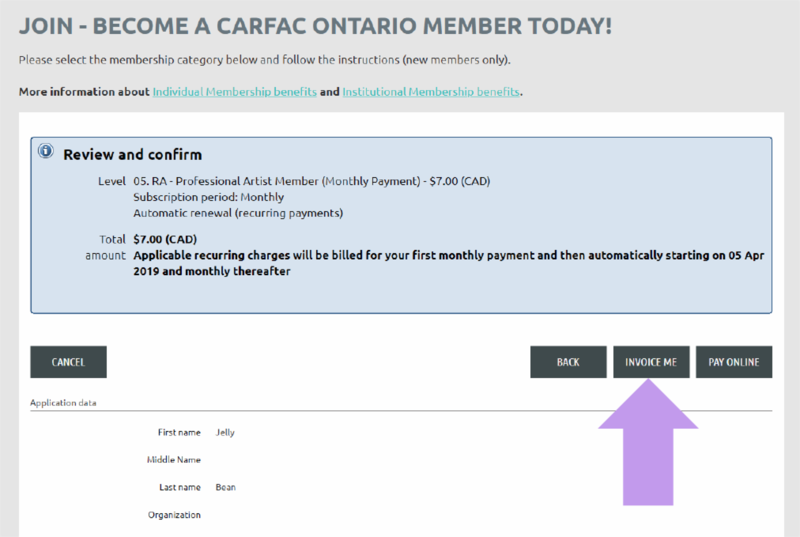 Now you have your new profile with CARFAC Ontario! 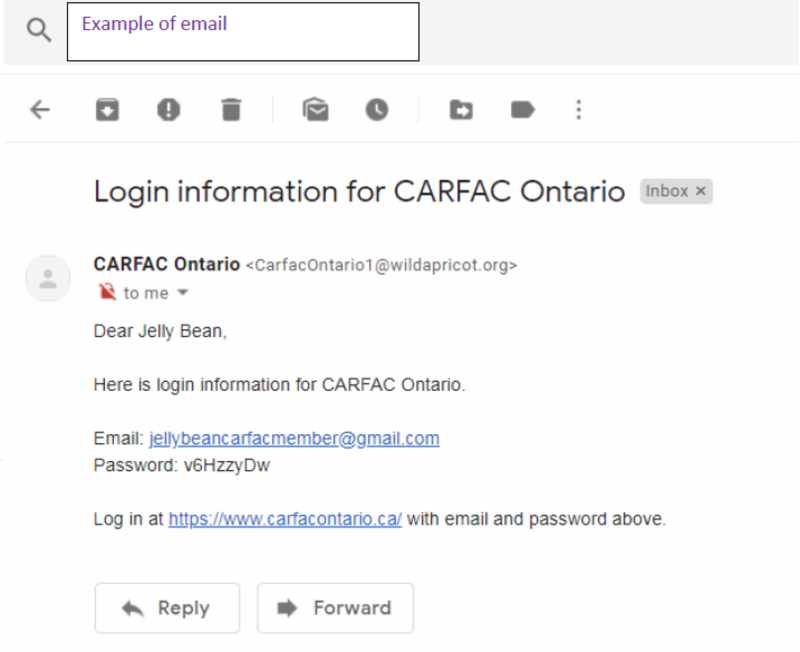 Now, check your primary email inbox for the new email with subject “Login Information for CARFAC Ontario”, where you will receive the temporary password. 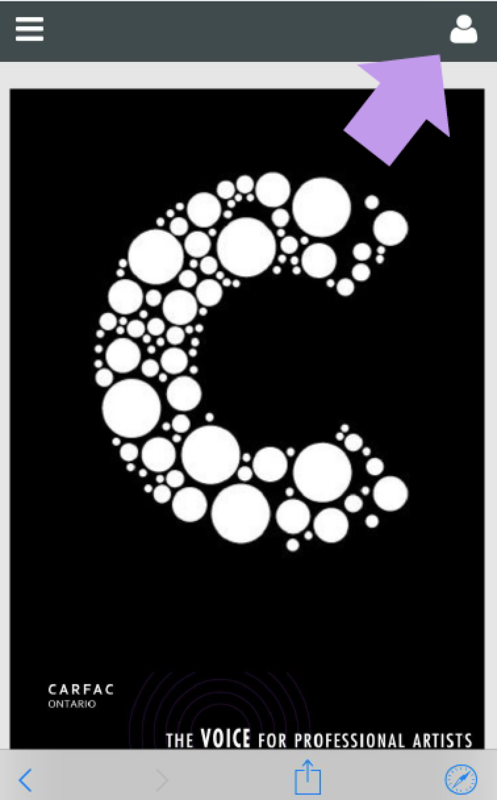 Then go back to the carfactontario.ca website, click the top right corner. 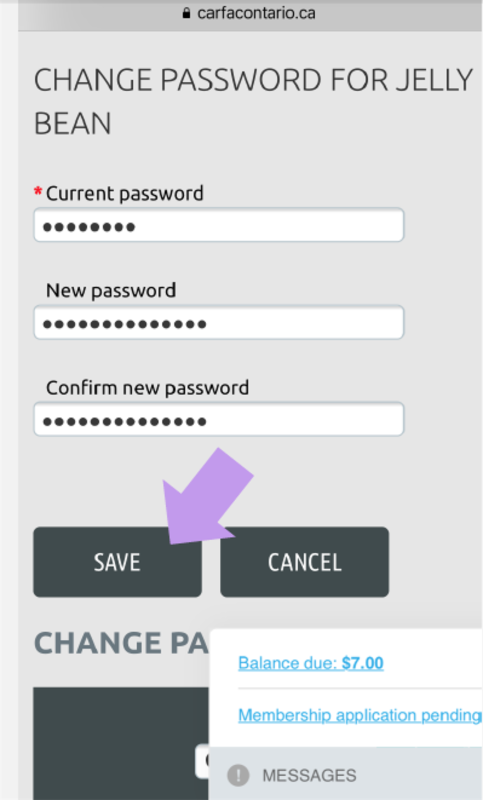 Paste the temporary password on the current password section. 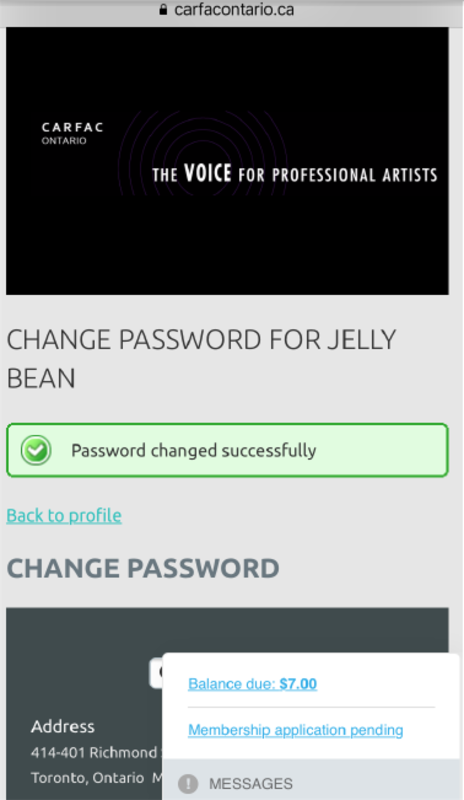 Then fill your new password and type again on “confirm new password” section. 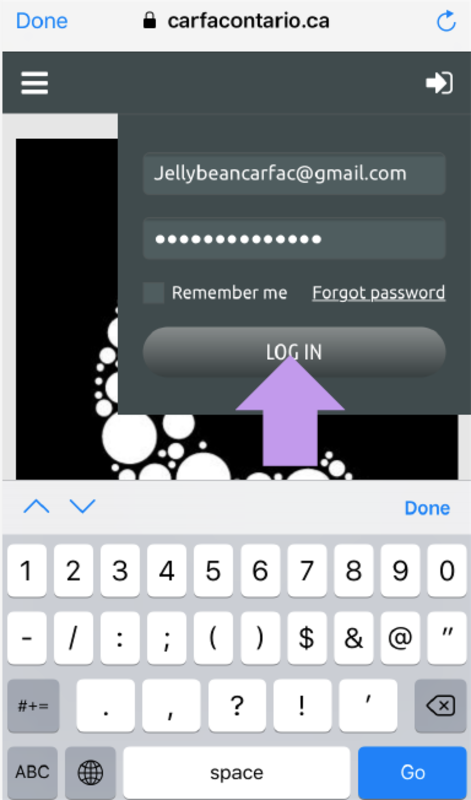 CARFAC Ontario staff will never have access to your passwords. However, we can reset it for you at any time upon request. Next page, the message appears “Password has changed successfully”. 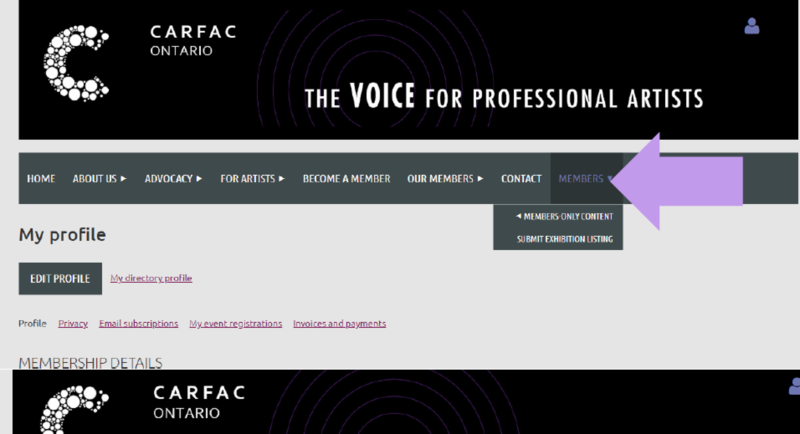 You will find yourself on the homepage of CARFAC Ontario. The CARFAC Ontario team approves every membership. 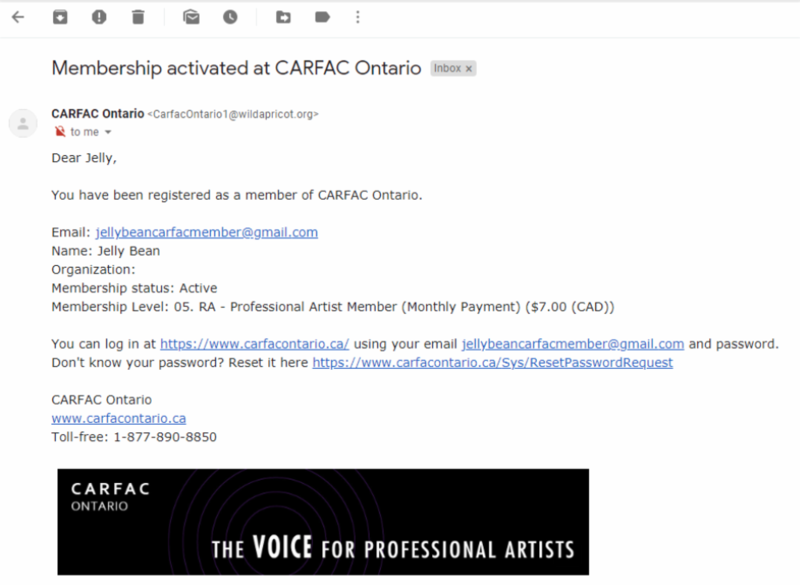 Once you have been approved, you will receive the email from CARFAC Ontario about your Membership activation. This is usually done on a daily basis during business hours. 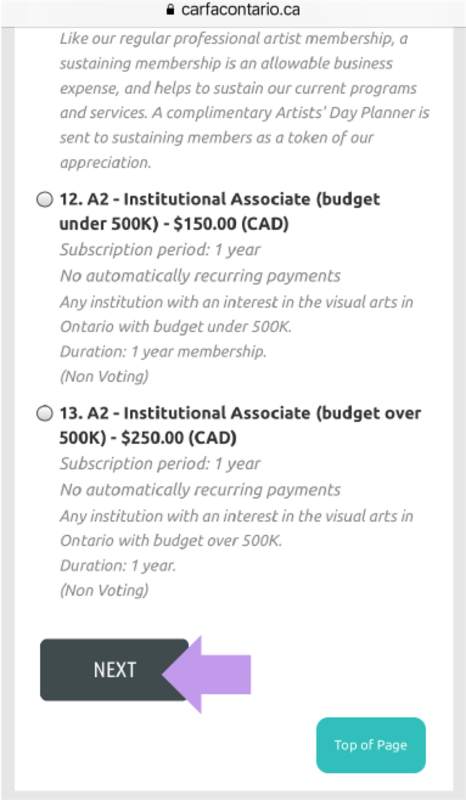 Approval for memberships is not based on your artistic merit, but to determine that one is not a robot. 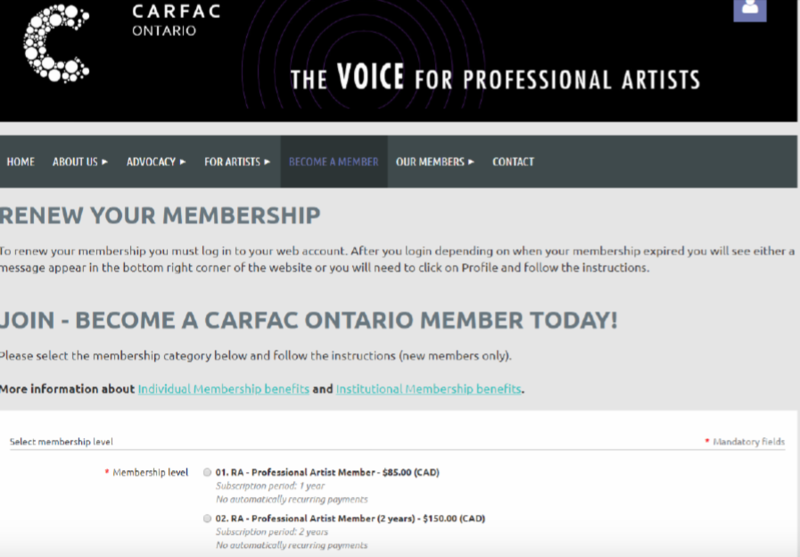 You are now a CARFAC Ontario Member! 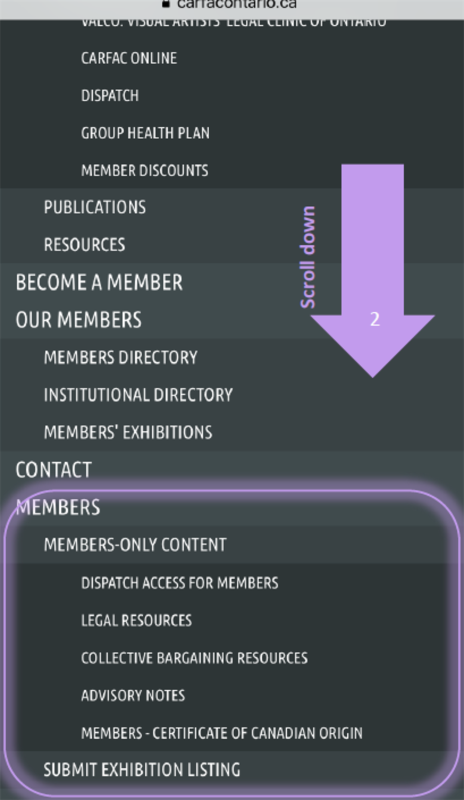 Now, every time you log in, you can change your membership type, find great resources under the exclusive “Members” only drop down menu that can be found in the top left corner at the top of page. To change your home address, telephone number or your bio/artist statement. Go the top, right corner click the silhouette icon. Fill your e-mail and your password. Then appears new page, scroll down until you will find your profile information. This is what your profile will looks like. 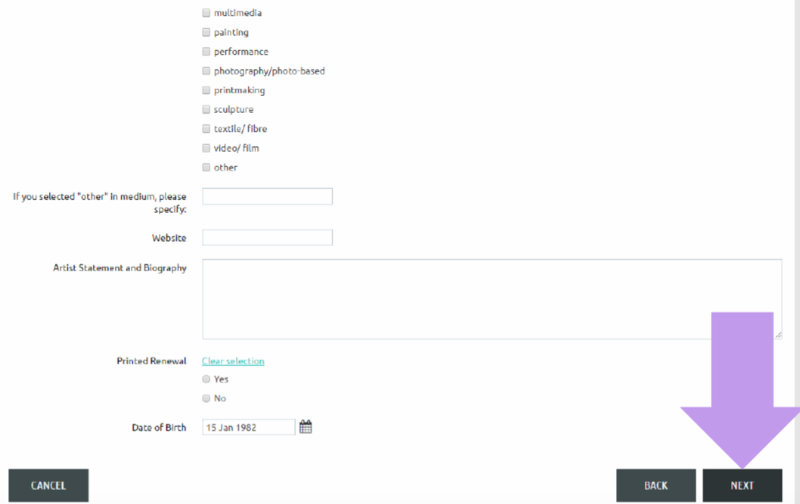 Then fill or update any of your personal information. This is what your profile page will look like after clicking "Save" button. 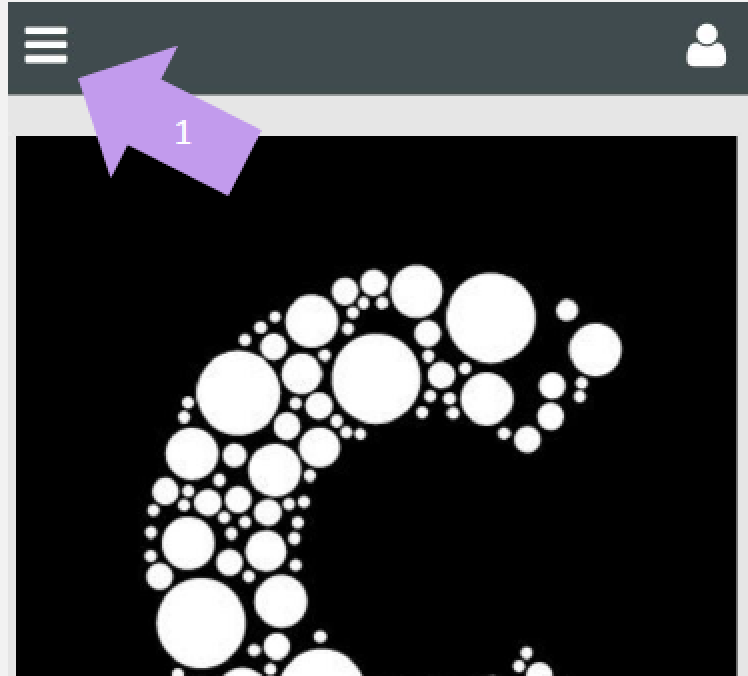 Once again, when you are done, log out from the silhouette icon in the top right corner. 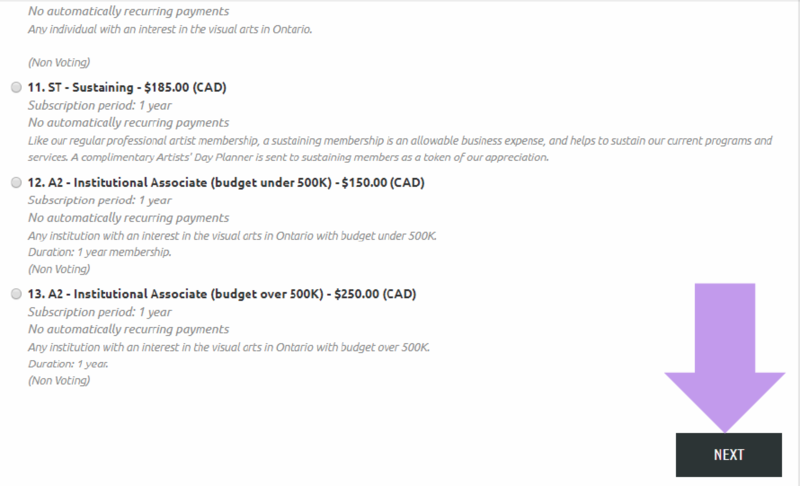 Then appears a home page of CARFAC Ontario. Come back to our website anytime. 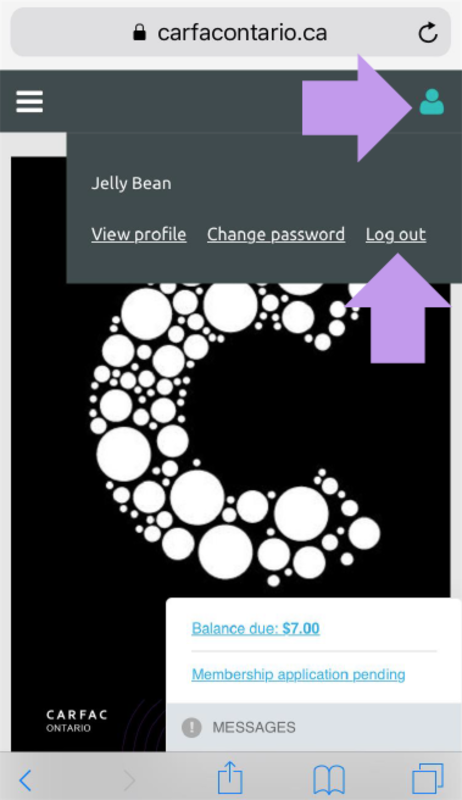 To access your profile or member’s only content, use the icon at the top right corner to log in with your email and your password. You can reach us at carfacontario@carfacontario.ca or call us at 416-340-8850 or 1-877-890-3340. 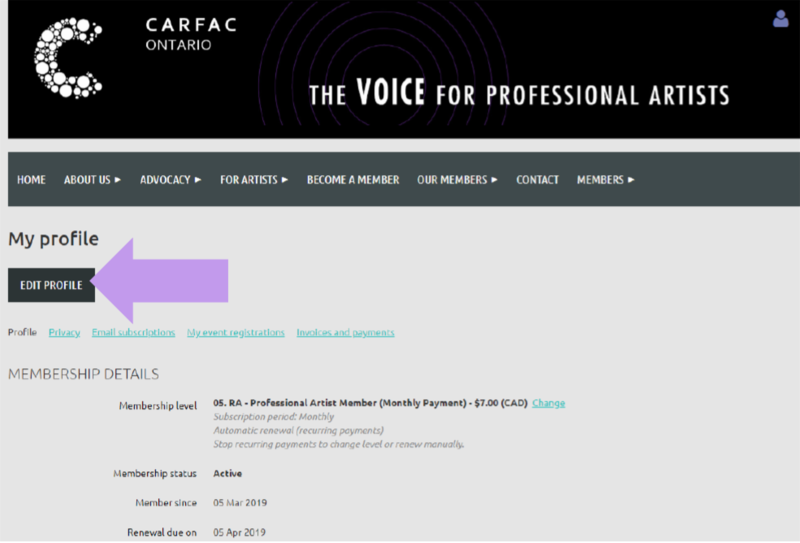 Thank you for supporting CARFAC Ontario and fellow artists. 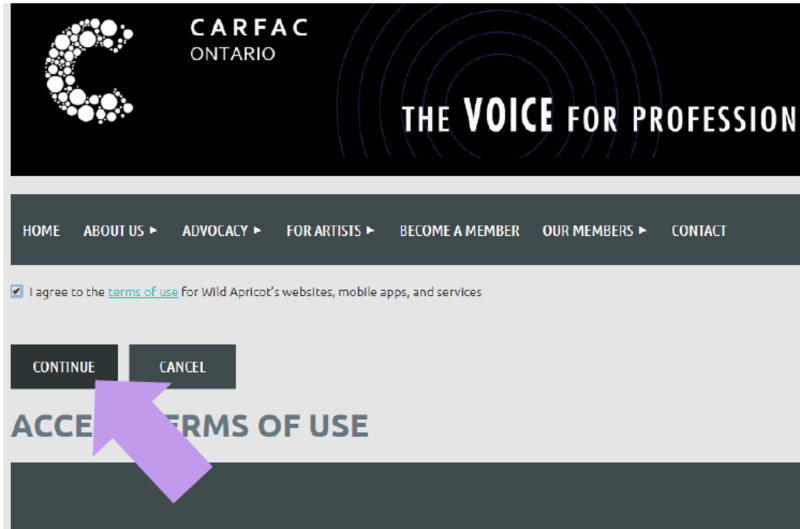 On the homepage, www.carfacontario.ca, select the button “BECOME A MEMBER” under the banner. 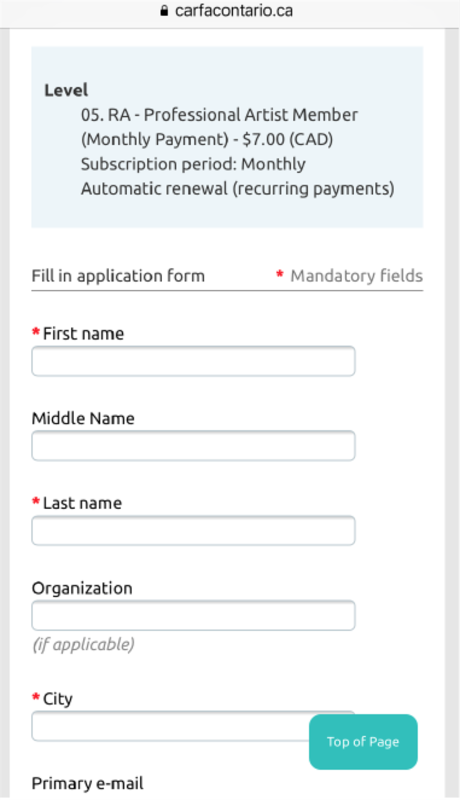 Then select one of these types of membership applicable to you. Then click “NEXT” button. After that, please fill your primary e-mail. Then click “NEXT” button. Next page, you will find the review information. 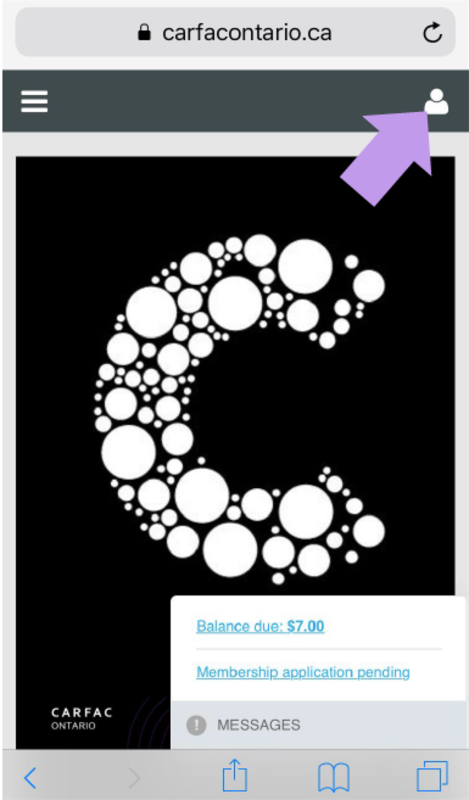 To confirm is click the button “INVOICE ME” or “PAY ONLINE”. If you would like to make a payment over the phone, please call 416-340-8850 or 1-877-890-8850, or mail in a cheque for yearly or biyearly payments, please make it out to “CARFAC Ontario” and please send to 414-401 Richmond Street West, Toronto, ON M5V 3A8. 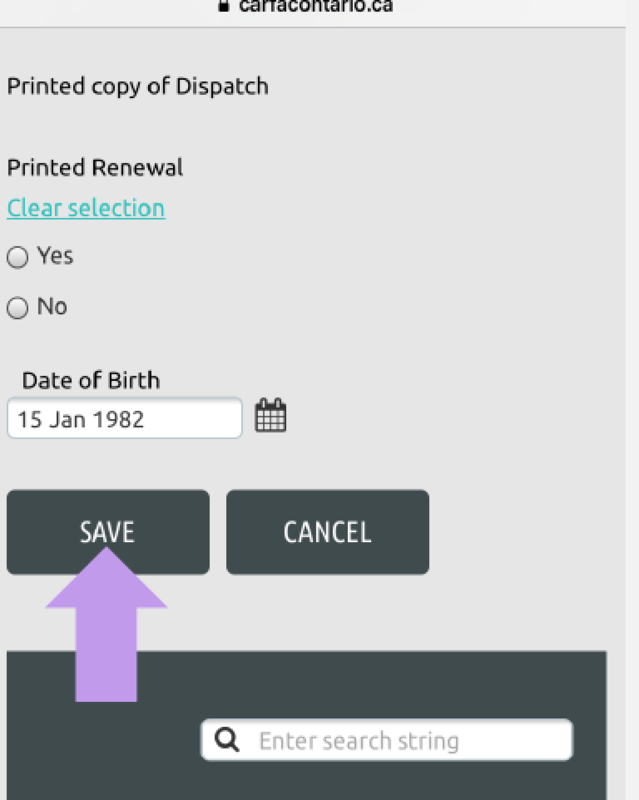 If you wish to change the information, go “BACK” button to edit. Congratulations! 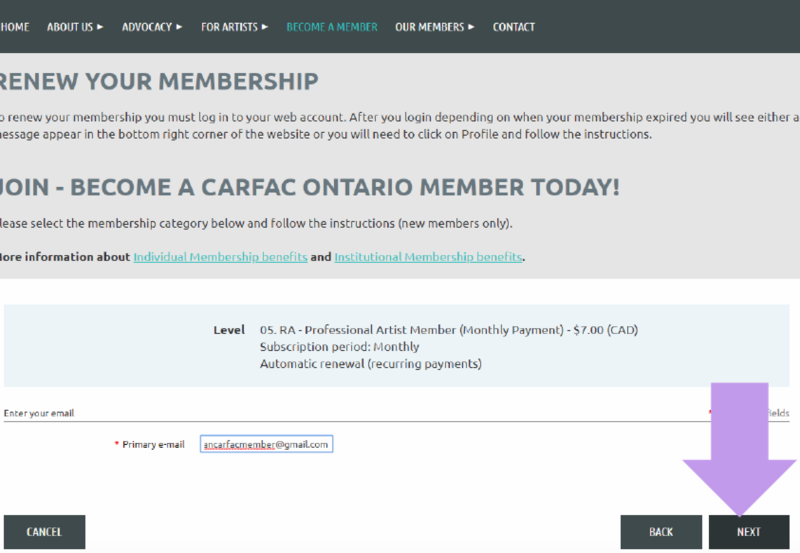 Now you have your new profile with CARFAC Ontario! 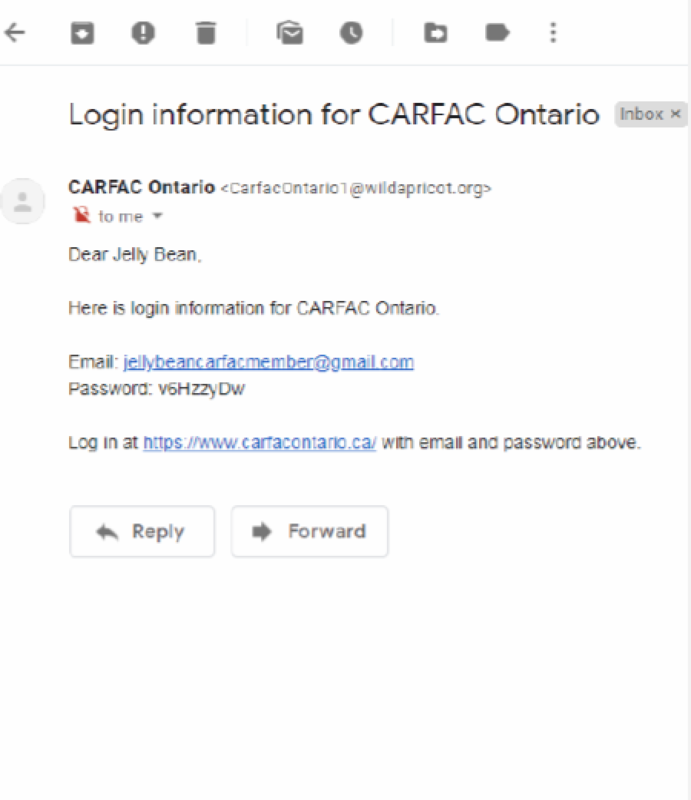 Now check your primary email inbox for the new email with subject “Login Information for CARFAC Ontario,” where you will receive the temporary password. Please copy the password. To do this with your keyboard select the password with your cursor or mouse, and then press both [Ctlr + “C”] for Windows Users; for Apple users press [Command + “C”] at the same time. 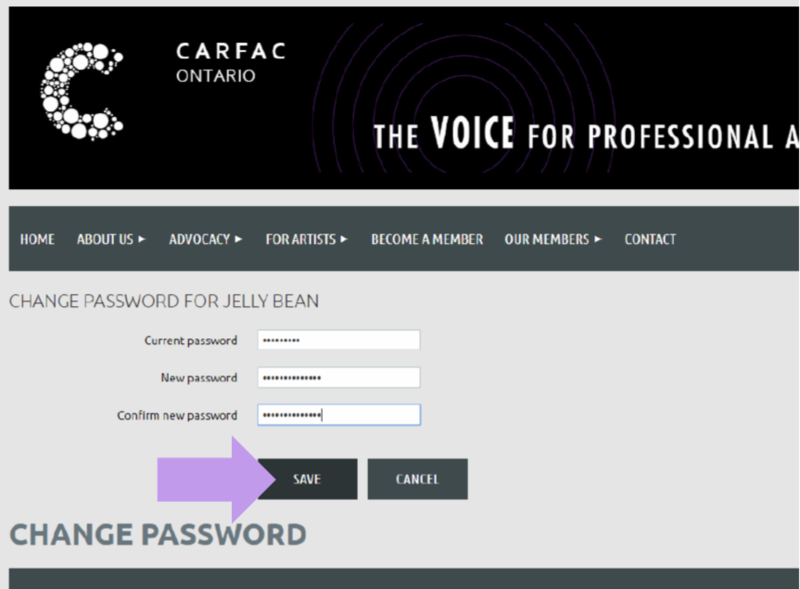 Now, go to the carfactontario.ca website, and click “Log out” that that is found in the top, right corner. 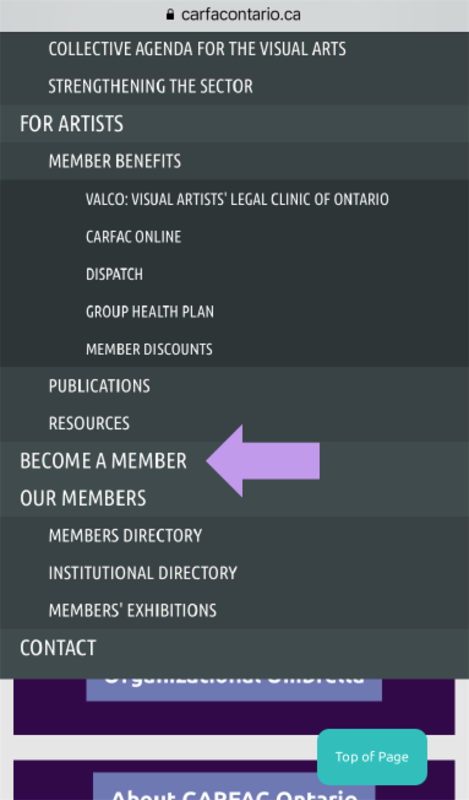 You will now find yourself on the CARFAC Ontario homepage. 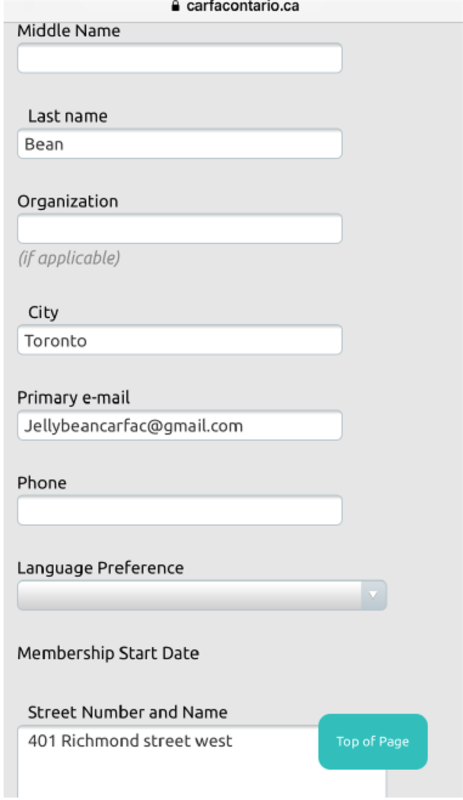 To continue, please fill in your email and paste your temporary password from your initiation email received from CARFAC Ontario. After you clicked “CONTINUE,” your profile will appear. 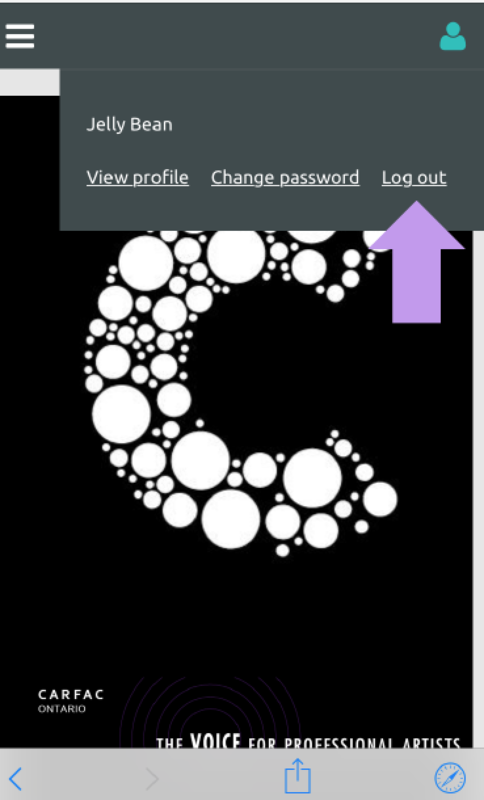 Go to the top right corner to click the icon button to customize your own password. 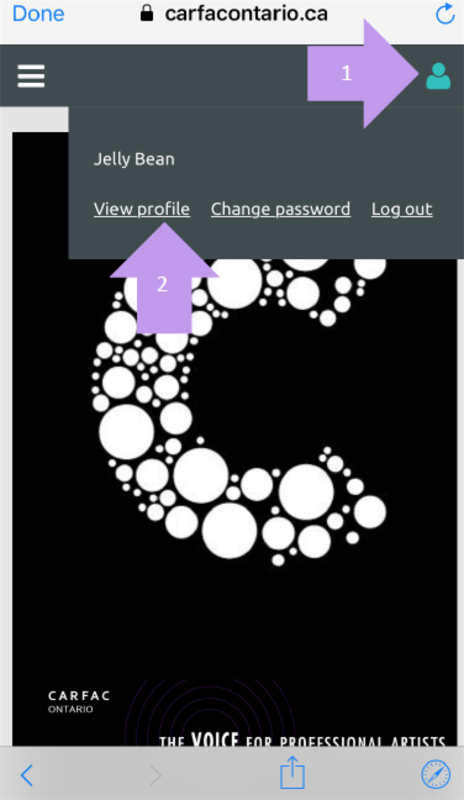 Click “CHANGE PASSWORD” in the mini window. 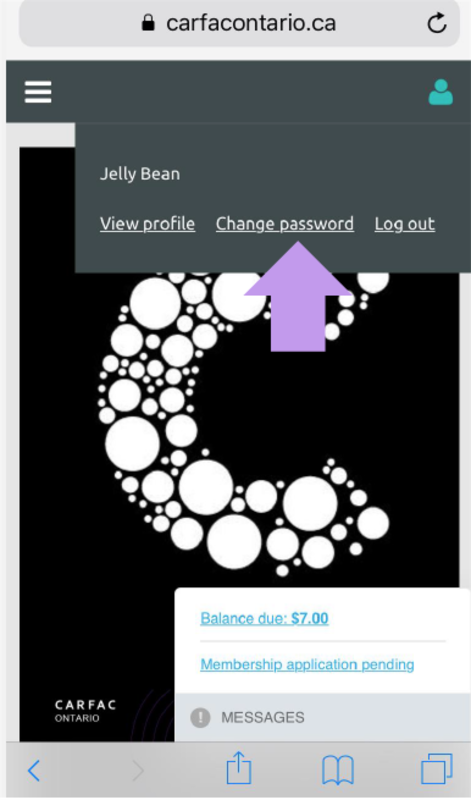 Paste or type the temporary password on the current password section. 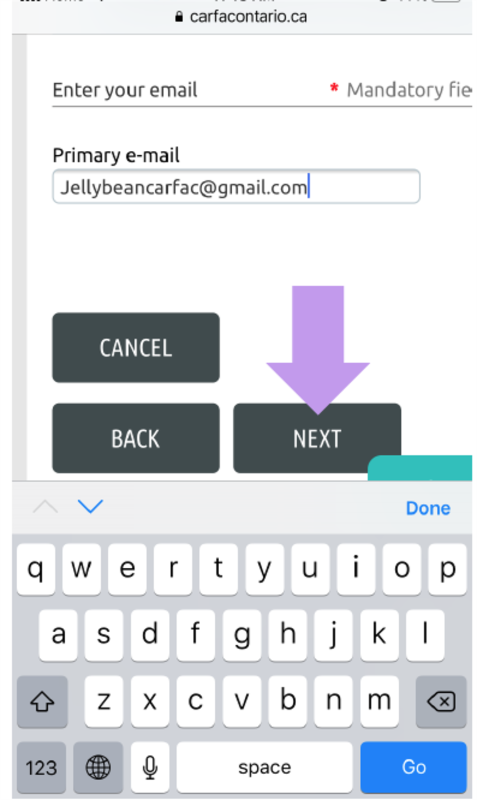 Then fill your new password and type again on confirm new password section. 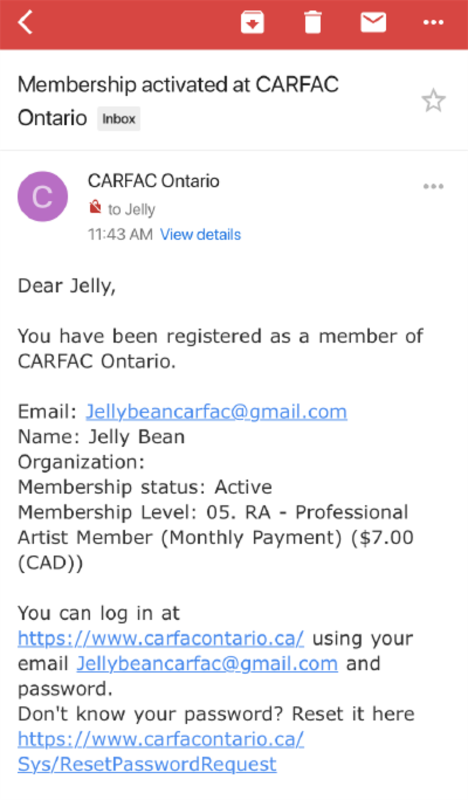 CARFAC Ontario staff does not have access to your passwords. However, we can reset it for you at any time upon request. The CARFAC Ontario team approves every membership. 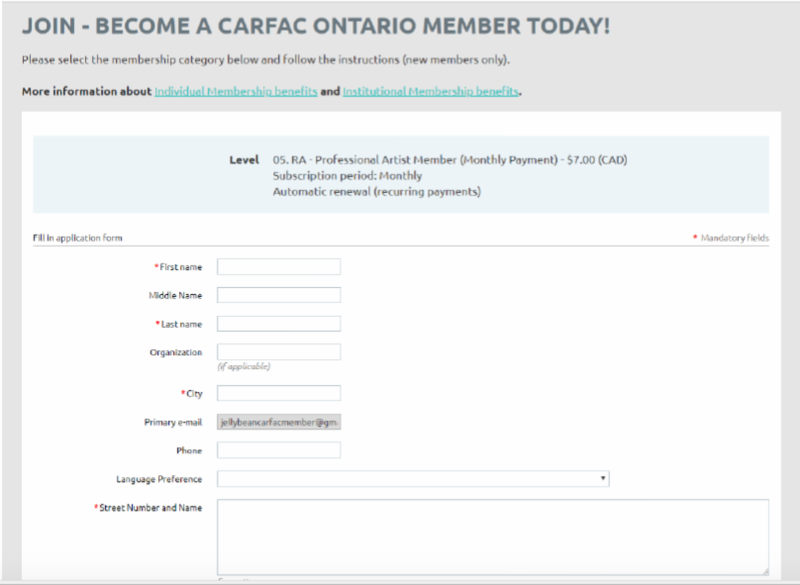 Once you have been approved, you will receive the email from CARFAC Ontario about your Membership activation. This is usually done on a daily basis during business hours. 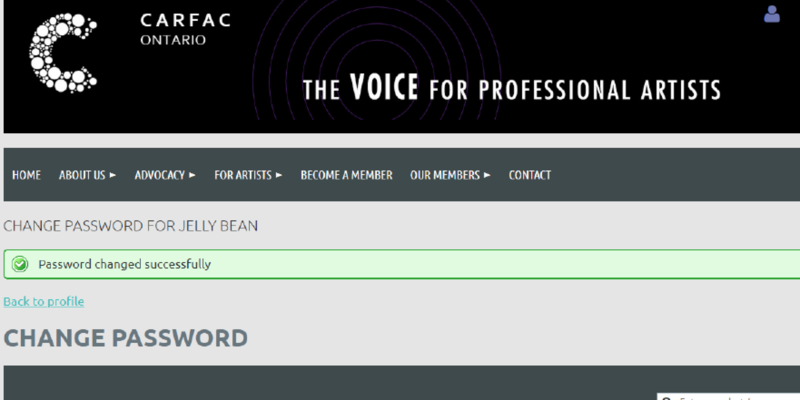 Approval for memberships is not based on your artistic merit, but to determine that one is not a robot. 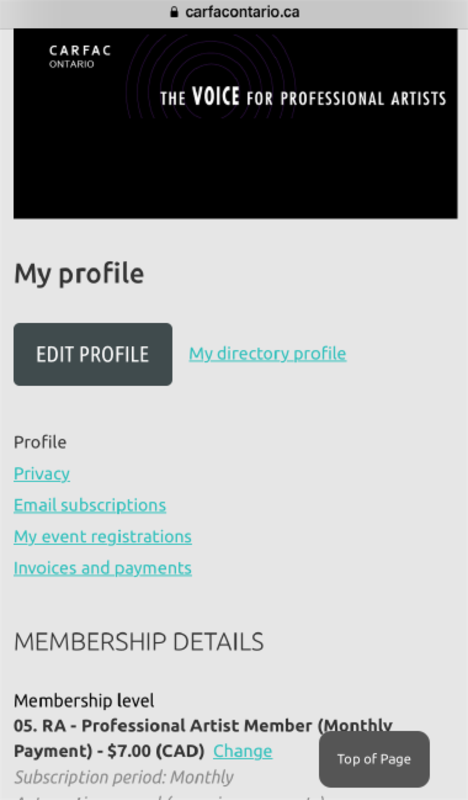 To update your profile such as changing your home address, telephone number or your bio/artist statement. 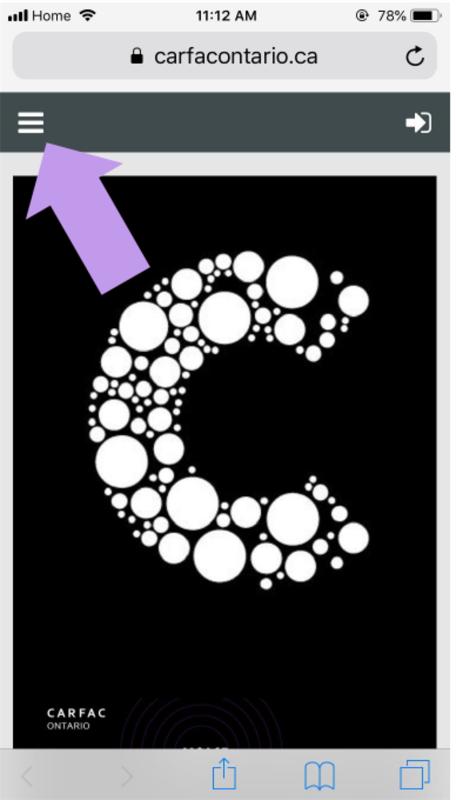 Go to the top right corner, click “VIEW PROFILE” button. Then click “SAVE” button. Log out when you are done surfing around the website. Come back to our website anytime. 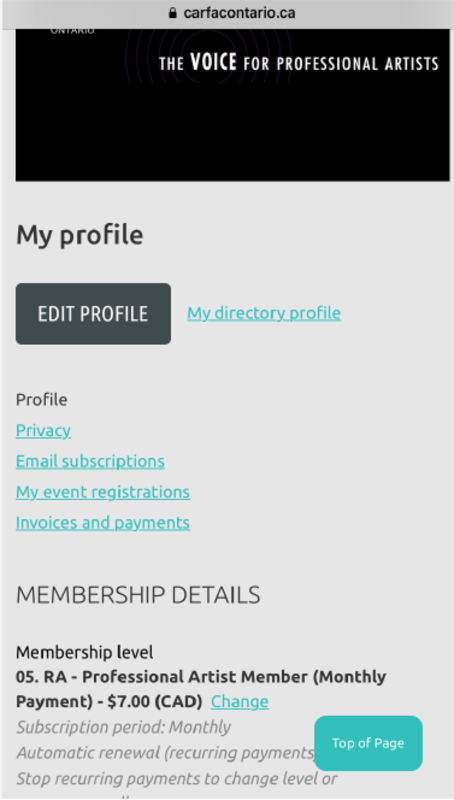 To access your profile or member’s only content, use the silhouette icon at the top right corner to log in with your email and your password.